Monet’s flower garden is divided by a broad alley. He designed the whole garden except this walk which existed when he settled into the house. When they came to Giverny this alley was lined by spruce trees. It was dark and full of shade, what pleased Alice: she could walk out in the garden without a parasol. 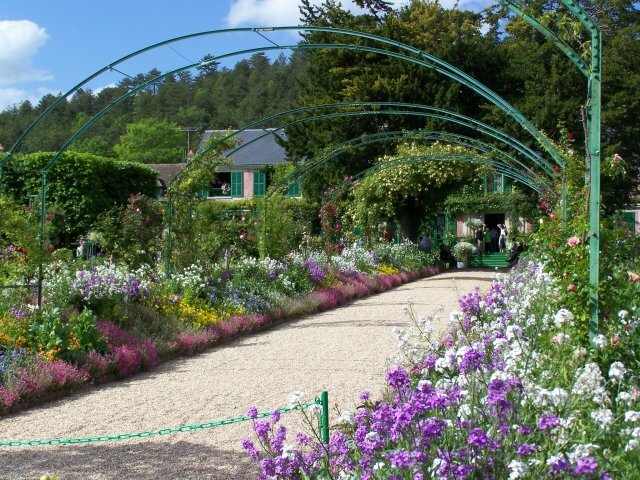 But Monet disliked the spruce trees because flowers would not grow in their shade. The couple had many arguements about these trees, and it is obvious who won. Did Alice give up, as a smart lady? Monet kept the two yew trees at the top of the way, and he cut the other ones at a four meter height. The trunks looked like columns. Monet grew climbing roses on them and between each pair of columns he had arches also with climbing roses. The result was lovely in spring. Now, only the arches and the yew trees remain.